By Karen Fryc and Alasdair Bright. 33 pages. Published by Bright-Fryc Publishing, Bedford, March 2016. 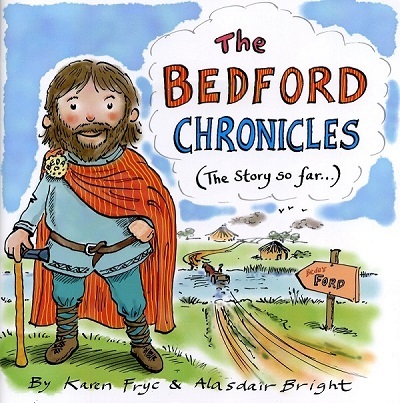 A short, illustrated book for children which tells the history of Bedford and the people and events that shaped it. It starts with a colourful ‘Timeline’, touches briefly on ‘The Stone Age’ and ‘Bronze & Iron Ages’, before getting into its stride with the Roman occupation. The town’s founding as a Saxon burgh is covered well, followed by the ‘Vikings’, including the Danish raid of 917. Norman and early Medieval Bedford is covered well, including two pages on the siege of Bedford Castle. Elizabethan Bedford receives four pages, including Sir William Harpur and a reproduction of Speed’s map showing the layout of the town. Ratsey’s hanging at Gallow’s Corner in 1603 and the story of ‘Black Tom’ add colour. The Royalist raid on Bedford in 1643 is covered, together with the great storm of 1672 (illustrated by a nice cartoon of the Swan’s gate being blown off and a flying dog). The treatment of the town’s subsequent history is sadly cursory, with the 18th and 19th centuries – periods crucial to our Bedford’s development and townscape – crammed into two pages. The final three pages provide a potted history of ‘The 20th Century’ and ‘Post-war Bedford’. The Harpur Trust are to be applauded for their far-sighted and generous sponsorship of this innovative project, funding free copies for the schoolchildren of Bedford. It’s vitally important that the next generation appreciate Bedford’s rich and diverse heritage and this is a great step forward to raise their awareness. The authors are to be congratulated on producing a highly readable narrative, with superb illustrations (reminiscent of the ‘Horrible History’ school), showing a good understanding of their audience. A remarkable amount of material has been included. It’s a shame, however, that the ground-breaking ‘The Bedford Chronicles’ is let down by poor proof-reading, in-accuracies and omissions. On page 31, for example, Glenn Miller’s name is shown as ‘Glen Miller’. The section on ‘The Romans’ is misleading, claiming that there “was a small Roman settlement in Bedford and some think it’s likely the Romans would have built a wooden bridge across the river, roughly where the town bridge is today”. There is no evidence to support this statement. The authors state “there may have been a large administrative centre at Manton Lane”, but this is currently an unproven hypothesis. On page 17 it is claimed that “While waiting for Miles [de Beauchamp] to surrender, King Stephen is said to have built himself Risinghoe Castle, a ‘seige castle’ which stood beside the Ouse”. James Scott Petre’s The Castles of Bedfordshire states that Risinghoe Castle, a classic motte and bailey, was most likely created in the eleventh century by Ralph Taillebois or his successor Hugh de Beauchamp. On page 29 it states that “The new Town Bridge was opened in July 1835 and for the first time you didn’t need to pay a toll to cross”. This is wrong – the bridge was opened in November 1813 and a toll (with toll house) was introduced to help contribute to recouping the cost of the bridge. The date of July 1835 was when the toll ceased and the toll house was then used as a post office. Lastly, on page 31, whilst it is correct that Bedford “did not escape the bombing” during WWII, the town suffered very lightly in comparison to most Midland towns and particularly Luton. There was some damage from the raid on 23 July 1943, but it is misleading to state that it caused “destruction to a large number of houses”. Turning to omissions, the most significant are the creation of the Ouse Navigation; Bedford’s Victorian and Edwardian educational heritage; the creation of The Embankment and Bedford Park; the development of Queen’s Park and Bedford’s engineering history (the only reference is to the Britannia Iron Works). It is hoped that any reprint can correct the above, as it is otherwise an excellent publication. That said, this book provides a welcome introduction for local children to Bedford’s history, for which both the authors and the Harpur Trust are to be applauded.